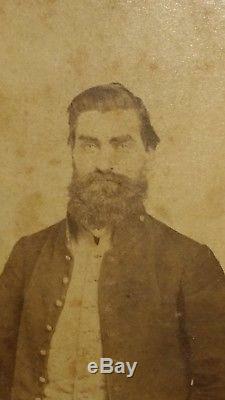 Civil War era CDV Private Co. A (3rd) Iowa Cavalry, David Bunch, I'd by known photo. 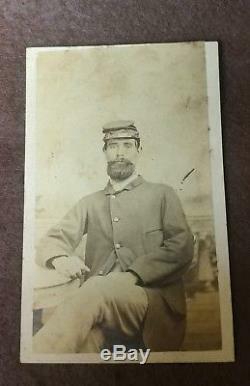 Here offered is a CDV photo (Cartes de Visite) of a 3rd Iowa Cavalry Civil War Soldier. This photo is of Private David Bunch we are pretty sure as Identified by the other photo that is signed by Bunch. Bunch and fellow soldiers were at the battle of Pea Ridge as I provided below in the note. The other photo of the 3 soldiers has Bunch in the middle and signed lower front of photo. These are for reference only. No gold lines but with the typical Civil War era thin card stock. Some soiling and top clipped and you can see the overall decent condition in our photos. 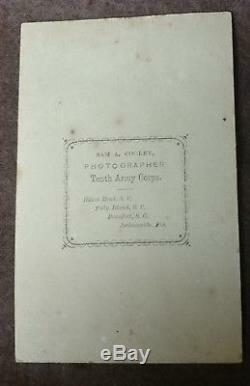 The backmark is Sam A. Cooley , Photographer , Tenth Army Corps. The 3rd Iowa Cav was part of the battle of Kirksville, Mo. In which the Union forces chased Porter across a section of Northern Missouri ending up in quite a battle in the town of Kirksville. Check out our photos of this one. The album is a Bunch family album. Here is an excerpt from an Original Report O. On the 7th of March, 1802, and I then and there saw about 300 Indians scattered over the battle-field, without commanders, doing as they pleased. On the 8th of March I saw what I would judge to be about 3,000 Indians marching in good order towards the battle-field, under the command of Albert Pike. DANIEL BRADBURY, First Sergeant Company A, Third Iowa Cavalry. Subscribed and sworn to before me this the 30th day of April, 1862. GLENN LOWE, Adjutant, Third Iowa Cavalry. Accounts and investigation of these atrocities of the Union Soldiers being scalped & if still alive but wounded , knifed or bayonetted to death lying on the field. Bodies were exhumed from make shift graves and this fact proven. A bit about the History of the 3rd Iowa Cavalry: The Third Regiment of Iowa Cavalry was organized under the proclamation of President Lincoln dated July 23, 1861. The preliminary organization of the twelve companies, which were subsequently assigned to the regiment, had been under the charge of Hon. Cyrus Bussey, acting as Aide-de-Camp to Governor Samuel J.
Kirkwood, and, under the direction of that energetic and capable officer, several of these partially organized companies had performed very efficient service in protecting the southern border of the State of Iowa from invasion by rebel forces from the State of Missouri. Upon the completion of their organization, the twelve companies were ordered to rendezvous at Keokuk, Iowa, and arrived at that place on dates ranging from August 3 to September 13, 1861. They were then re-mustered into the service of the United States by Captain Charles C. Smith and Lieutenant Ira K. Knox, of'the United States Army, between the dates August 30 and September 14, 1861. When the muster was completed, the rolls showed an aggregate strength of 1,096 men, rank and file. They fought at the Battle of Pea Ridge, Siege of Vicksburg, battle of Mine Creek and many more engagements. Google these fellows of the 3rd Iowa Cavalry and you'll find they saw allot of action and were all over the Civil War theater. Check out our photos, add this one to your collection! Great Gift for the Special Person!!! We guarantee all our items 100%! The item "Civil War era CDV Private Co. A (3rd) Iowa Cavalry, David Bunch I'd by known Pic" is in sale since Monday, July 9, 2018. This item is in the category "Collectibles\Militaria\Civil War (1861-65)\Original Period Items\Photographs". The seller is "oldgunhunter" and is located in Macon, Missouri. Civil War era CDV Private Co. A (3rd) Io: Civil War era CDV Private Co.